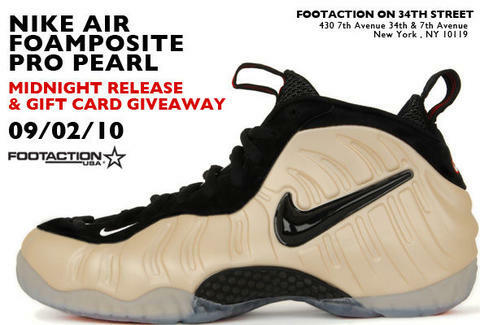 Special Midnight Release: the Nike Air Foamposite Pro "Pearl"
Tonight at midnight, head to Footaction at 34th St and 7th Ave for the release of the Nike Air Foamposite Pro "Pearl": the latest stage in the saga that started in 1997 with the Foamposite 1, famously worn by Penny Hardaway, whose tiny doppelganger once famously ranted "the only time you guys yell box out is when you're having donuts!". Boasting that same groundbreaking injection molded foam material, this particular Pro model was limited to only House of Hoops stores upon its original 5/23/09 unveiling -- and since as of that date there were only three such stores, there's a good chance you missed out on it. So hit this slightly wider (but still very limited) release, and everyone who sees your shoes will know you're licensed to Lil'.